Photo by Axel Marcenaro: Acoustic Kollabo gives a solid performance at the K-pop Mini Concert. In addition to bands and singers, the concert featured multiple dance routines. 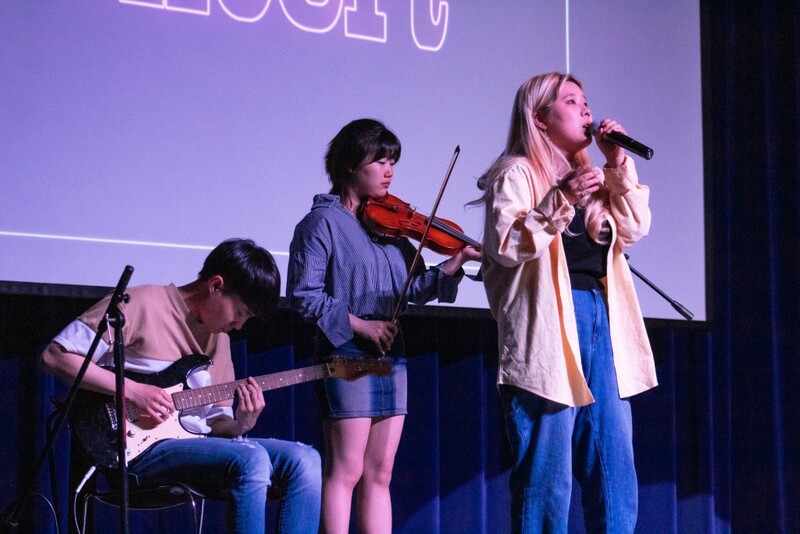 The Korean Student Association on April 5 held the K-pop Mini Concert in the C.J. Davidson Center for students to sing and dance to K-pop music. The KSA wanted to give everyone who is and is not familiar with Korean culture a chance to have fun and learn about their music. The event was open to anyone interested in K-pop who wanted to enjoy a free activity on campus. With over 100 people in attendance for the mini concert, many students were excited to take part in Korean culture. There was also an opportunity for performers and the audience to win prizes. The participants were not ranked because KSA wanted everyone to have a chance to win. Since there were 12 winners, each prize was different for each person ranging from snack sets to cosmetics. A total of 17 students performed various types of Korean music during the concert. The first to perform was Acoustic Kollabo, which is the only K-pop band at ASU. They played three songs by different famous Korean artists. Eight teams sang during their K-pop performance while the remaining 9 teams competed to dance with the music. “I think it’s a good opportunity to learn from others and other people’s culture and it’s great for students to go,” Majano said.